Play games from our selection of more than 300 board games. You will find them on the stage roughly divided between strategic, family, party and children games. Do not miss any! Do you want to expand your board games collection? Or maybe, do you want to start one? Then, you should not miss our flea market in the Foyer. A lot of games at incredible prices are waiting for you! Aaron Meeple, a hitherto normal game enthusiast, has gone crazy! We don’t know why and when, but sometimes he sits in front of the Volkshaus throwing dice at people. Passers-by heard him say that he wants to sabotage the BasGame! That’s not like Meeple at all, since he has actually always liked games… Sneak into the appartment of the lunatic and find out what Meeple is up to and how to stop him. But attention! You only have 15 minutes of time until Meeple returns to his appartment, and his secret is well secured! He has turned his collection of games into a tricky riddle chain, which is supposed to keep his secret plan from intruders. Only a team of true gamers can win this challenge! In collaboration with Breakout Basel, this year in BasGame you will be able to test your deduction skills in our trial escape room. You will have 15 min to solve all the riddles and escape from a unique room especially designed for BasGame. This is a one-shot opportunity! Register here to reserve one of the available slots. How good are you at estimating things? Will you be able to get close to the total number of meeples that are stored in the glass jar? If you do you can win a great set of games! Three games. Very simple rules. You, against the clock! Will the pressure be too much? We don't think so! If you are the fastest solving all three trials, a collection of games will be yours. 12:00 - 14:00: Earthdawn; Fiasco; D&D 5th Ed. 18:30 - 20:30: Fiasco; D&D 5th Ed. Welcome to Fiasco, a gamemasterless role-playing game about powerful ambition and poor impulse control. And yes, it's going to be a fiasco indeed! You can find Fiasco in the RPG Corner for a test round (in English; ca. 90 min). It doesn't matter if you are a role play veteran or a total rookie. Join the group and play a mystic adept with magical powers in a shattered fantasy world in the age of legends. Experience an introduction into the classic role play Earthdawn with the new story based system by Vagrant Workshop (in German; ca. 120 min). The original roleplaying game in its 5th edition, Dungeons and Dragons is high fantasy at its best. Sign up for a short introduction to swords, sorcery and subterranean adventure! (in English; ca. 120 min). Do you trust your Captain? Would you follow her through the clouds? Is he really able to avoid the dangers in the sky? These are the questions that you will ask yourself regarding your teammates in this exciting and funny trip. If you are able to balance trust, risk, and benefits you might have a chance to win this tournament of Celestia, organized thanks to Blam!. Klask is a fast-paced epic magnet battle, best described as a table-top Air Hockey. Hit the ball with you magnetic handle to defend your goal and trying to score. Thanks to Game Factory, in this tournament you will not only need a good eye-hand coordination, but be able to keep playing while laughing uncontrollably. Ahoy, matey! Prepare yourself to defend yer Jolly Roger in the most intense and funniest race on the seven seas. Yo Ho Ho! BasGame will host a Jamaica tournament thanks to Game Works and Swiss Games. Ready the cannons, loot the gold, and sail with the wind. Aargh! Do not miss our play-and-win corner. You will have the chance to try a game and, with a bit of luck, take it with you. This year: Time Arena thanks to Blam!, Long Live the Queen and Diesel Demolition Derby thanks to Ludicreations. All day long, we will host brilliant young designers that will share their prototypes with you. Do not miss this chance to talk, learn, and maybe influence on upcoming board games. Helvetiq is an international game and book publisher based in Switzerland. This year marks our 10th anniversary. So far we released more than 40 games in 15 languages for 16 countries. Our publications range from kids and family games to party games. WALLS packs catapult action, strategy, building and aiming skills, real life physics and a small portion of luck, together into one box. Matt from Scydes, brings a final stage prototype to BasGame 2018, to expand the fanbase and get closer to mass production. Take your shot to experience this refreshingly different tabletop. In Game Design at Zurich University of the Arts (ZHdK), between 7 and 10 new board games are developed each year. First, rules and concepts are analyzed and the mechanics are questioned. In teams of two, students then develop their own board game, test and refine it, and design a playable prototype. Vagrant Workshop / Pro-Indie is a private alliance of independent game designers led by Carsten Damm. We're dedicated to quality, only releasing games and supplements we love and believe in. 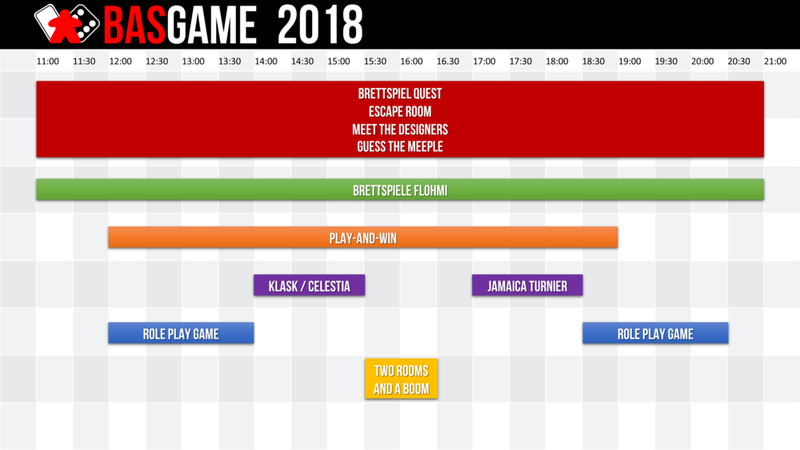 With Carsten Damm and Mikko Goepfert two of the game designers will be at BasGame and present some of their published role-play games as well as some new prototypes of card games currently in development. Treecer is a team of three friends that will present their debut game in BasGame: Darwin’s Choice. Hand-illustrated by the French illustrator Rozenn Grosjean, this game will be launched in Kickstarter on May 8th. At BasGame you'll have the chance to try the game while the Kickstarter campaign will be fully underway. Haas Games was founded in 2015 and develops card games in which strategy and tactics get connected with educational aspects. Further priorities of Haas Games are a high degree of interaction and the feasibility for quick learning, while guaranteeing the necessary degree of game depth.